Well really wasn't I doing so well with my daily Eisteddfod updates until Wednesday. After that the wheels started to fall off the wagon. I got tired, sometimes a little bit snappy and basically was not anywhere near my computer. Therefore, no fascinating posts to read. So let's see - On Thursday morning I wore my green silk wrap around skirt and green tshirt. Then I perspired my way through a morning session at the Parish Hall which is sans airconditioning, so I had to change at lunchtime into cutoff jeans and the coolest tshirt I own. Much better. It was a marathon day though. I didn't get home until 1am. The cat was not impressed with the lack of dinner. I also discovered that I had left the iron on for 24 hours. Amazingly the house did not burn down. It wasn't even very hot. Phew! Crisis averted. Today I had to Go To Work. Blah...not nearly as interesting as Eisteddfod stuff. Then I spent the afternoon madly trying to ring people to put together a Gala Concert - TA DA! In between this my mother and I paid a visit to Officeworks where the friendly staff girl photocopied us 200 copies of the program and we browsed amongst the stationery while we waited. I nearly bought a new phone case. The power of suggestion is indeed powerful. And then, this evening, the final concert and presentation of awards. I wore my most colourful skirt which I had bought on special at The Tree of Life last visit to Brisbane. It is very long and swishy and I love wearing it. We then went to the Brothers' Club - very seedy and scary Bundy nightlife but I did splash out and drink a green tea. Good laughs and conversation. I plan to spend the weekend doing nothing, in between watching all the TV I have recorded during the week. I am tired. I stayed up too late to be getting up at 5:30am. As a result I am wearing a little more makeup than usual under my eyes (shadows) and have hacked into the mascara even though I know that by the end of the day I will look like a raccoon because it makes my eyes itchy. And I itch them. Highlights of the Eisteddfod yesterday were the secondary school choirs. Such stunning work. I never thought I would listen to Enya with delight but Shalom Catholic College sang a fantastic arrangement of Orinoco Flow and sang with so well. They were pipped at the post by St Luke's Anglican College who sang a madrigal and another piece I don't know the name of but it was very beautiful. What a treat. And last night my dearest piano student talked herself into an attack of nerves with her Brahms Intermezzo although still was Highly Commended. She did recover beautifully to win the Australian composer section with The Forest Stream by Miriam Hyde. Primary school choirs can be less of treat. There were some good ones but there were also quite a few who are still working on the difference between singing and speaking. Still, the participation is high and the kids are having fun which is what it's all about in the end. In other news, my feet hurt and by the end of yesterday they were also extremely whiffy in the skechers. So today I have chosen green green green. Green T shirt with a little silver trimming along the shoulders plus my trusty green converse sneakers. Sadly, I do have to do go work from 9-2 so I shall miss the junior and senior concert bands. This is okay because concert bands are not my Favourite Things. Sadly, though I will miss the senior string orchestras which I love. I hope to be back in time to have missed the recorder groups, but to see the orchestras and stage bands. Oh and I only lost my cool once yesterday and shouted at someone amidst the chaos. There were two other times when I was Miss Assertive and Very Proud of Myself. Day 3. I'm awake,showered, dressed and eating my breakfast at a time when I would usually still be in bed. My eyes are being held open by imaginary matchsticks and I am steeling myself for the day of a zillion children singing in their school choirs. Shortly, they will descend on the Civic Centre - perhaps the ugliest and least-acoustic friendly venue in Queensland if not Australia - to sing "two pieces of a contrasting nature". Perhaps I exaggerate. There may not actually be a zillion. However, I do not exaggerate about the venue. The reason we use it is it is the only place in town that can accommodate so many children and our regional council (and the councils before it) have not seen fit to build a specific performing arts centre (unlike nearly every other major regional centre up and down the coast). In other words, our Civic Centre is crapola but we use it because we must. Highlights yesterday, the double bassist I accompany came first with her two movements of a Corelli Sonata. She was thrilled and perhaps a little stunned because the competition was high. This morning at 8:30 we play Faure's Apres un Reve which is very very beautiful. Surprise! I actually found a bass version. In other news today I am wearing denim skirt, brown t shirt, and skechers. It's a day of lots of walking ahead. The best bit will be the takeaway coffees in town. Well we survived Day 1 although it was not so much a day as an afternoon. Everything went smoothly. Children made it on to the stage and played their instruments, which after all is what it's all about. I went up and down the stairs at the theatre about 20 times (there are about 15 stairs). As a result of my extreme unfitness my calves are now killing me. Look music AND free step class. There was a small moment of drama when one of the lights blew and a shower of sparks fell into the orchestra pit. I heard the fizzing but missed the light show which was disappointing. We are hoping nothing important has blown fuse-wise. Oh and in other news it was STINKING HOT AND HUMID which was slightly unpleasant. I am hoping this cooler morning signals a more agreeable day weather wise. So what lies ahead? Today we begin with three sessions and a double session this afternoon. Yesterday was only orchestral instruments. This morning we have some singing, some duets and some older age groups. This afternoon is my favourite section - piano 8 years and under. They're so tiny. Some of them wear bow ties. Yesterday one young man playing the cello wore a red glittery hat. We should all wear red glittery hats. However, today I have chosen my coolest top possible after the sweatorama of yesterday and my dark red patterned wrap around silk skirt. Earrings - gold filigree. Necklace - el cheapo big butterflies pendant thingo. Shoes - brown sandals - not the height of shoe fashion but will not give me blisters. Plus, nobody is looking at my shoes. Now if I could just find a hair band I would be set. I'm very optimistically calling this post Day 1 in the hope that I will post the highlights of the Music Eisteddfod every day this week. Please don't be surprised if you see nothing on the blog until next weekend. We gently start today with one afternoon session (1.30 at the Playhouse theatre in Steffensen Street if you happen to be in Bundaberg). Then we can all go home and watch TV and pretend there is not a week of highly organised chaos to follow with three sessions per day sometimes at two venues at once. Oh yes, it gets exciting. It also sometimes gets a little bit too serious for some parents. I choose to ignore their Eisteddfod parenting. I was indeed a child of the Bundaberg Eisteddfod growing up. Thankfully my mother was not an Eisteddfod parent. The closest we got was planning what I would wear every day so we could be organised in the fashion (and I use the term loosely) department. We did not compare adjudication reports with every other competitor in our section. We did not expect to win. We did not make written complaints to the committee within 15 minutes of the section finishing because we didn't win. And so it goes on. Luckily (and I say this with my fingers crossed) we do not seem to have any of these parents at the moment. However, we have had in the past and they make things Very Unpleasant for all concerned. So here's to a fun week of music making for all the students, teachers and parents concerned. Now I must check my list to see what I am supposed to be wearing today. Now, technically I understand it's Friday which technically means it should be fun tshirt Friday. There is a slight problem with this today. It's my day for interviewing new applicants for our term 2 intake so I thought probably best to save the joy of seeing one of my tshirts until they are actually in the program. So today I shall substitute the next best thing. That's right, you guessed it (or maybe not)...my new green striped tshirt. There are two wonderful things about this shirt. 3. In a crisis I can pretend to be a pirate. 4. If only I had an eye patch, cutlass and chest filled with gold doubloons. Now, never fear, I shall still be watching television. It's just doubtful that I will have the energy or the brain power to post anything about it. So it's been a pretty dull day at work - the usual stuff, email, phone calls, battles for term 2 timetables. Then you're driving home after making a routine stop at the IGA for milk and bread (which is ridiculously overpriced I do believe) and you continue on your merry-ish way thinking, "when is that freaking pixies cd I ordered over the internet ever going to arrive? the concert was a month ago. have I been scammed? etc and so on and so forth". And then, you arrive home, tumble out of the car with your empty lunch containers, milk, bread, handbag and see in your letter box a suspiciously promising white parcel. 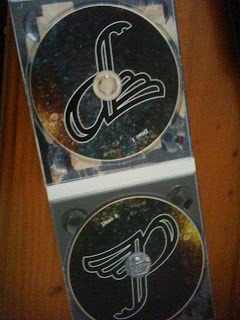 Could it be CD shaped? Could it? Yes it could. For perhaps the first and only time I use this word in a non-ironic way: Awesome. I shall now cook dinner whilst listening. Then I shall eat dinner while watching last night's Daily Show/Colbert Report combo. Following on from there I will watch Kerry and Barack and then I shall watch tonight's DS/CR which I am recording. Oh yes. Life is full of small excitements. "If you watch a lot of TV you're not considered well-viewed"
So our shiny new Vice Chancellor decreed that there should be a celebration of research at our not so shiny and new university. He also decreed that it should take place this week. Last night the Bundaberg campus held its event, an evening of 5 minute talks by researchers for the community and students to attend if they so desired. I did a little talk about watching TV. I decided that if I talked about my actual research everyone would fall asleep and/or look at me strangely, given that the bulk of the audience were local councillors, sciencey-type people from govt departments, and local business people. So I gave the following very light talk. I got a bit nervous with the audience demographic. Some of them even looked like they woke up. They did laugh in the right places which was good. TV is nothing if not constantly changing medium. We can watch it all shapes and sizes - from our mobile phones to our gigantic media rooms and everything inbetween. This technological development is one part of TV’s interest for me. The other aspect of TV that is fascinating is of its programs: the shows we sit down and watch each night. My particular interest is television comedy. In my PhD I examined some iconic moments in Australian TV comedy –including Graham Kennedy, Norman Gunston, Roy and HG and Kath and Kim. The future of my research as an Early Career Fellow with CQUniversity’s Learning and Teaching Education Research Centre lies in the genre of the television mockumentary, those TV programs which appear as documentaries, but blur this look with black, satirical comedy allowing them to often cuttingly critique various aspects of our culture. For instance, those of you who watched We Can Be Heroes it may be impossible to ever take the Australian of the Year awards seriously ever again. And if like many of us you watched Roy and HG tear apart the pomposity of the Sydney Olympics, it may well be that you will never watch an opening ceremony or mens’ gymnastics with quite the same innocence that you once were able to. My intention over the next two years is to consider the past, present and future of television comedy, particularly looking at the mockumentary. This means I will get to watch a lot of television, including groundbreaking programs like The Office, The Hollowmen and Summer heights High among others. "I find television very educating. Every time somebody turns on the set I go into the other room and read a book"
Now, the answer to this question is not “Nothing”, but rather “Plenty”. Television matters to our understanding of ourselves and the world around us. If you wear your disdain for television as a badge of honour I may not be able to convert you to my cause. However, if you have watched any television in the past week or so I hope to convince you that in doing so you were actually engaging with arguably one of our most powerful cultural technologies. Television presents the world to us but let us not pretend that it presents the whole world to us without fear or favour. No indeed. Television “represents” the world to us. Perhaps the simplest way of explaining this is to consider what it chooses to broadcast. Television teaches us that some events are more important than others. For instance last week news and current affairs were saturated with Tiger Woods. Never mind that there was an earthquake on the American west coast or the government was being overthrown in Kyrgyzstan. I even understand that Britain is having some kind of election. This all paled into insignificance because an overpaid, although highly talented sportsman lost some sponsors but made a return to professional golf. Here, television is teaching us that a fallen celebrity making a comeback trumps politics and natural disasters – on the commercial stations at least. What does this example teach us when we see that so many of us then discussed Tiger rather than Gordon Brown around the lunch table or over dinner? It tells us that we may well have been influenced by the choices made by a television editorial executive. This is a simple example of how television represents the world to us; how it teaches us what is deemed important, what is valued, what we should be fascinated by and of course, what we should not bother ourselves with. As citizens living in a media age we ignore TV at our peril. Instead, we should watch television and lots of it. And we should watch it with a critical eye. As Clive James noted in one of his 1970s television columns for The Observer, “Practically everyone who watches television has a critical attitude to it to some extent”. For those TV watchers among us, we are all quite certain as to what we like and what we don’t. But I am encouraging you to watch television even more carefully than that. Ask yourself, what is it that you particularly like or dislike about certain programs. Is it the fast paced action, the excruciating close-ups of human remains and autopsies, the wit, the jokes, the silliness, the arrogant whinging of airplane passengers, the time travel, the medical procedures tinged with romance, the solving of crimes and mysteries, the melodrama of Ramsay St, the apparently desperate housewives of Wisteria Lane. Perhaps it’s watching people transform from obese to healthy while being gently tortured, or the indepth analysis of current affairs. Perhaps like me you take an interest in the colour of Alan Kohler’s tie each night on the ABC News, or maybe you are confused as to why Tony Jones insists on taking questions as comments on Q and A. Do these things amuse you, horrify you, mystify you, entertain you, make you cry, inspire you or even just plain annoy you? Television, like all our other forms of popular culture can do all these things. "If you read a lot of books, you're considered well-read. But if you watch a lot of TV you're not considered well-viewed"
As a TV studies researcher I am in the process of becoming well viewed and it’s my challenge to convince everyone else of the importance of doing the same. So in conclusion this evening I am going to set you on the path to television enlightenment with some homework. You might want to note this down under the heading of "Programs I Must Watch". Revisit The Young Ones on ABC2. Try Burn Notice on Channel Ten. Enjoy Margaret and David battling it out on At the Movies. And give the wonderful British comedy Beautiful People a try. Once you have completed those set viewing assignments you might want to consider the following recommended viewing (some of which you will need to seek out on DVD) - Grand Designs, Talking About Your Generation, Doctor Who, Seinfeld, Torchwood, The Big Bang Theory, The Colbert Report, Bones, Frasier, MASH, Northern Exposure, Seachange, The Antiques Roadshow, The Daily Show, Rockwiz, The West Wing, Black Books, Father Ted, and The IT Crowd. This extra viewing is strongly encouraged, but please be aware it doesn’t attract any extra credit. It's been some time since our last communication so I thought I would take this opportunity to write. I hope you don't mind but I am going to provide you with a little constructive criticism. Please take it in the spirit in which it is intended. That is, get your freaking act together and start behaving. 1. If you could perhaps have a word with the seasons and tell Summer to pack its bags it would be much appreciated. I thought we had done with the humid, bad for sleeping nights but based on last night, clearly not. It's April for goodness sake. Let Autumn have their turn. 2. Headaches. I don't know if you've ever woken with the same headache you went to bed with but let me assure it is an unpleasant experience. If you could remove the headaches from your mornings that would be delightful. 3. Waking up early. My alarm is set for 6.30am for a reason. I do not need to wake in the grey half light of 5am. I have getting ready for work down to a fine art with my 6:30am iPhone wakeup call. There is no need to give me a "helping hand" by having me wake up any earlier. I do hope you have a nice day. More importantly, I hope that I have a nice day. So what happened on my telly this week? Bones: Yet another repeat I do believe. Hey Channel Seven it doesn't bother me because I haven't seen them before, but it's probably really quite annoying for long time fans. Apparently though tonight is a New Episode. It looks exciting because it's something to do with the devil but you can bet your bottom dollar lil orphan Annie style that it won't be about that at all. Monday was choir night but my sort of trusty Dvd Recorder did not fail me and I got to see The Big Bang Theory when I got home. Mild hurrahs. Sheldon was managing to pick up girls without realising it. The best bit was when one of them suggested that she "share credit" on his groundbreaking new paper and he turned all nasty. No, that doesn't sound like the great big world of academia at all. Ah, Tuesday was a little bit unusual. I had searched all shops in Bundaberg for a particular DVD for my sister's birthday on Thursday. However, rather than finding that I bought myself a present. Series Two of the IT Crowd was marked down at Sanity. So I rewatched a few episodes before trying again, and sadly failing to persevere with QI. I love Stephen Fry and Alan Davies, but I just can't get into this show. I know. I'm a failure. Wednesday was marked by the successful location of the DVD at KMart, shop of last resort. So I watched Yes Man with Jim Carrey while I ate my dinner. It was really quite sweet and enjoyable, if a little bit silly. Silly can be good. Really, anything with Rhys Darby from FOTC is a winner with me. Then I ignored the TV until it was time for Beautiful People at 9:30. It was another cracker of an episode picking the eyes out of the late 90s (and continuing sadly) trend for garden makeover programs, and the ubiquitous water features that accompanied them. Delightful. Thursday there was very little television as it was Birthday Dinner time. Friday it was Second Birthday Dinner Time but I did get home in time to watch Being Erica. You know why I am watching it? Because there is nothing else on and it's the kind of inoffensive television that you can sit through quite happily and immediately forget. Today I plan to watch Blue Murder with the wonderful Caroline Quentin, because finally I remembered to record it. And then if time I will catch up on my Coen brothers' inadequacies with Fargo. Yes I realise, that's hugely embarrassing that I haven't seen it. And good golly how much are we all looking forward to the return of Hey Hey Wednesaturday this week? 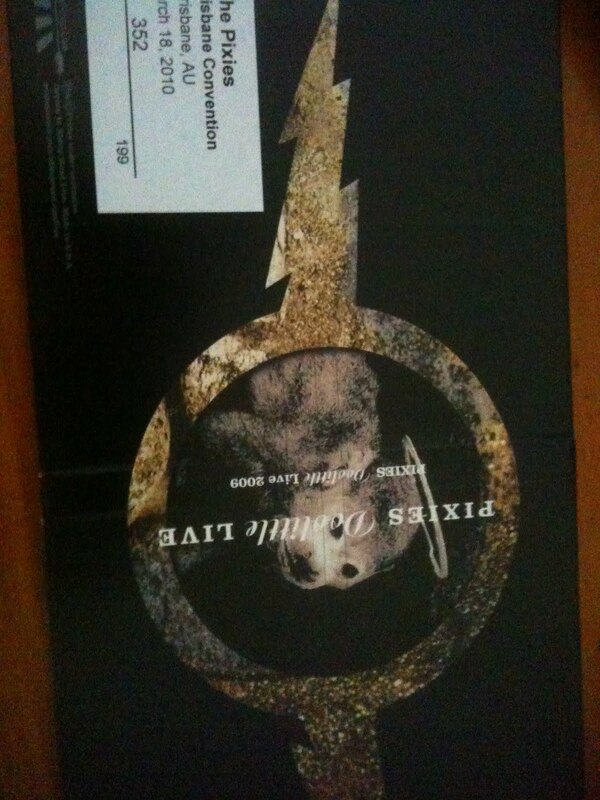 Sometimes....not often...I arrive home to find exciting things in the letterbox. 1. The original copy of Miriam Hyde's The Forest Stream which I had ordered only last week from the Australian Music Centre. Very prompt service and an absolute bargain at only 10 dollars. 2. Seven past theory papers for Grade five Theory of Music from the AMEB. Again very prompt service. Thank you AMEB Queensland. 3. One "uber" @Rockwiz prize for my previous Rocktwizzing. A four CD of "The originals behind the covers". That's right. You heard me - 4 CDs. Excellent, I think for taking to work, playing in the car and just generally listening to any time I can. 4. A plastic bag with three avocados and one completed Grade Five Theory of Music practice paper. That's right. You heard me - three avocados. 5. An Optus mobile phone bill. Ok so that's not technically exciting, but on the upside it isn't for me. So..you know...hurrah! You may be noticing a theme in terms of the "Grade 5 Theory of Music". My wonderful piano student is doing her exam in May so she usually completes a couple of practice papers per week. She is also sitting for her Grade 8 Piano exam in May. She's 14. And her dad works putting irrigation systems on to farms so that explains the avocados. Now I am all confused. See it's the first day of the working week today which is usually a Monday, but the calendar is telling me it's Tuesday. Usually I don't like Monday very much and Tuesday is okay. But with you, Easter, stuffing everything up with your fancy-schmancy Monday holiday how am I to know what to expect today? Will it be Monday? Will it be Tuesday? Will it be some devilish combination of the two? On the upside I do realise there are only four working days to the week. On the downside there because the holidays confused me and I spent three of the four days marking there is very little in the way of food in this house so my lunch today is looking particularly unusual: One banana, One boiled egg, two pieces of bread, one slightly stale hot cross bun. Mmmmmm the food of working champions I don't think. I shall report back this afternoon. Could this be the best Monday of the year? It's like getting a do-over for Sunday which is nice because I spent Sunday finishing my marking. So as far as Sundays go it was a bit of a bust. This was a good thing though, because it means I don't have to do any today so I am free as a bird. This would be the kind of bird who intends to eat a bit more chocolate, read, watch dvds, sleep and just generally laze about. In between those fascinating activities I shall be doing my washing and having a bit of a tidy up. I am tossing up between watching The Darjeeling Limited and Fargo. I own both of these and have never watched them. Ever. If I got started now I suppose I could watch them both. Now, there is a radical thought. Two movies in one day. Heavens to Betsy what is the world coming to? Such slothful chillaxin'. I don't know if I can cope. Best go and do something a little bit productive first. Washing up, or sorting the dirty clothes, or perhaps run the vacuum through the house. Firstly, I think blogger is mucking around with some comments. If you have commented and it has not appeared please believe me it's not from me not clicking "approve". Something weird is happening. Anyhoo to more important business. Television. Twice I have failed to set my DVD correctly this week. The first failure occurred on Sunday evening for the Quentin Crisp program. I managed to record the first twenty minutes rather than the whole thing. And then I thought I had recorded the follow up on Wednesday evening about the musical boy with cystic fibrosis but my DVD recorder had other ideas. But I see there is something else on about him tonight. But it clashes with Bones. And I am going to be out. So I am in a big dilemma. I did sadly managed to record about 10 minutes of the lamentable Hungry Beast before getting on to Beautiful People which was fabulous darling as always. This week it had a Eurovision theme. Enough said. Monday, I did thankfully manage to set the infernal device correctly for TBBT. Sadly, it wasn't the strongest of episodes. Still, there is some comedy to be gained from Sheldon's inability to drive. HaHa. I was so bored on Tuesday evening I almost watched it again. What else was there? Not much of note except for my semi-religious viewing of The Daily Show and The Colbert Report. These are really the only decent regular nightly programs. Apart from Alan Kohler's finance report. And I only watch that for the ties. And the mystifying graphs. I did persevere with Being Erica. Ho hum. Erica learns about herself by travelling back in time. La di da. Not that interesting. And the thing that follows it is worth watching if only because it stars Fran from Black Books. No other reasons really. Rockwiz last night was a repeat with Kasey Chambers and Shane Nicholson. Always watchable. Their Kylie Minogue cover was an unexpected delight. And that's it, unless you count the fact that I recorded Grand Designs revisited and slept through it yesterday afternoon in a post-marking stupor. Probably that doesn't really count I guess. This is a little bit of a rambly Week of TV. I apologise. I have just marked 80 or so assignments in three days. My brain is tired. And also a little bit bored. Yes I know...what an original title for a post about Easter. Puns ahoy. Here are some iPhone snaps for your enjoyment or otherwise. A moody self portrait. 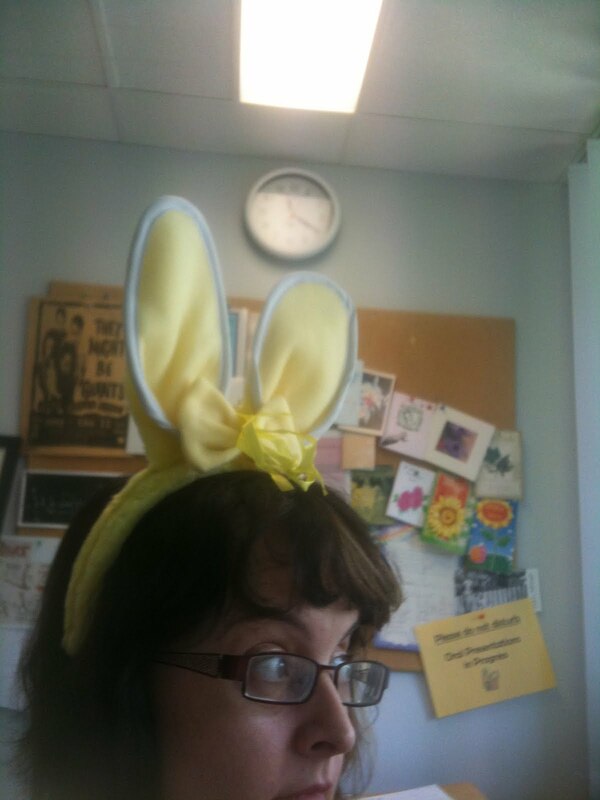 It was difficult to hold my phone far enough away from myself to get the ears in shot. Need longer arms. 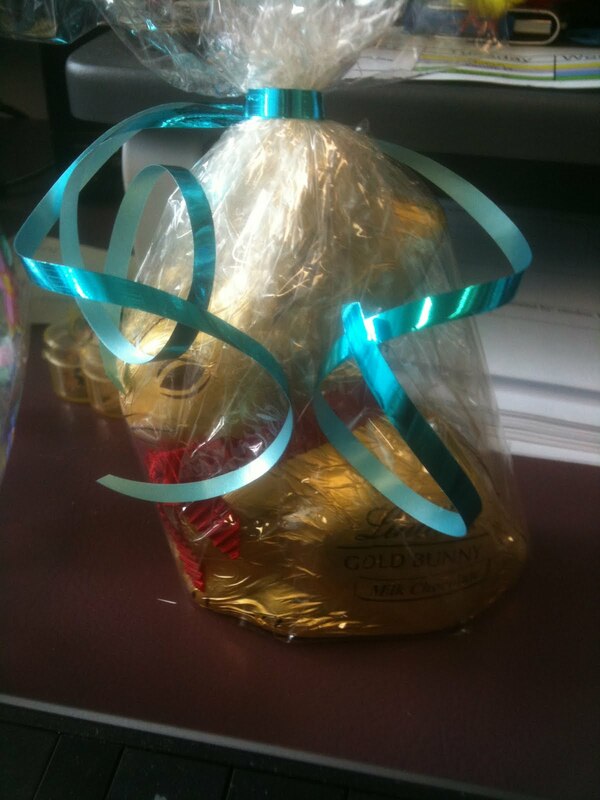 Aaah....Lindt....how did we ever celebrate Easter without your presence? 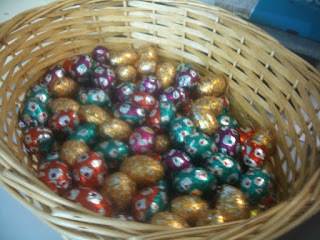 Aaahh...really cheap chocolate eggs from Sam's Warehouse. Made in New Zealand apparently. I made sure not to eat any. 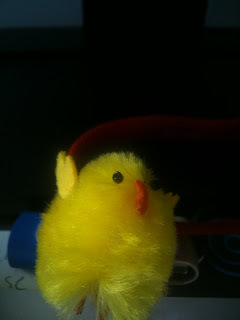 Aaaaah... a cute little chicken. 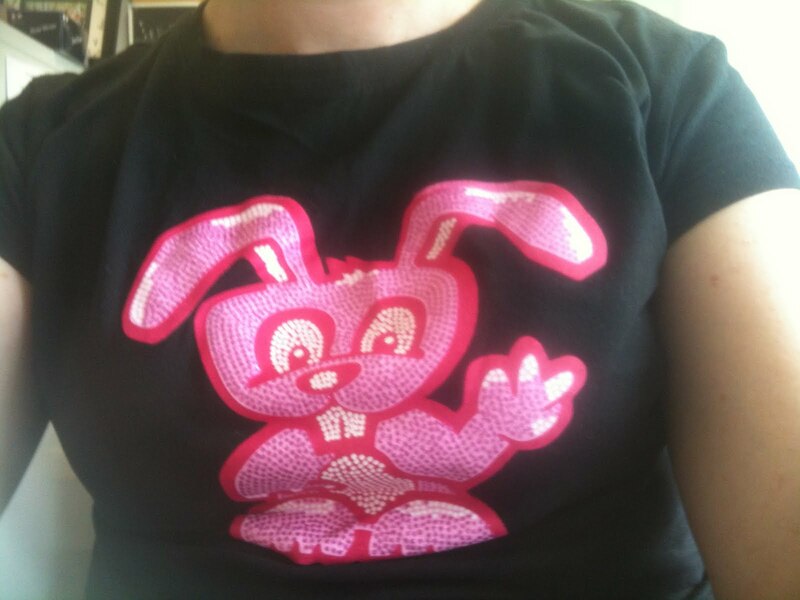 Aaaah... a slightly freakish, scarily pink Easter bunny shirt. Aaaah...Supre how did we celebrate religious holidays before you started producing cheap themed clothing? 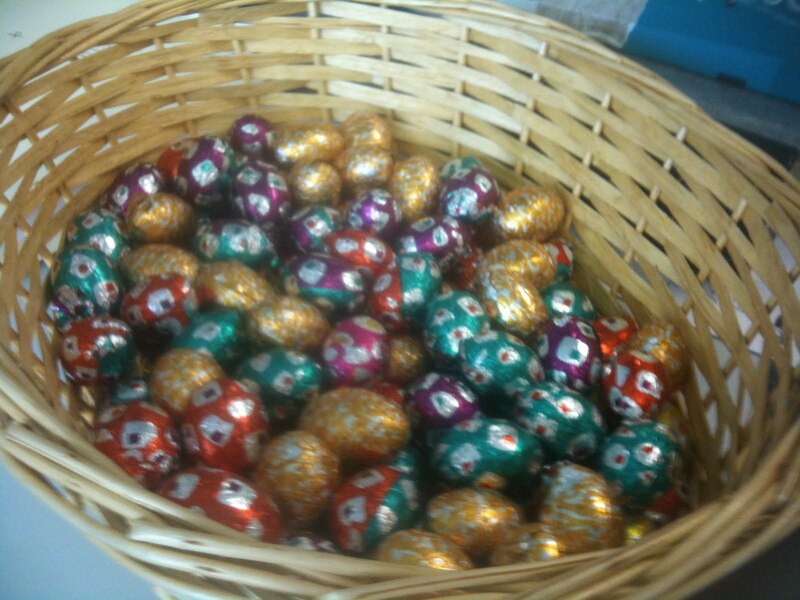 Aaaahh... a lovely gift of assorted chocolates etc. 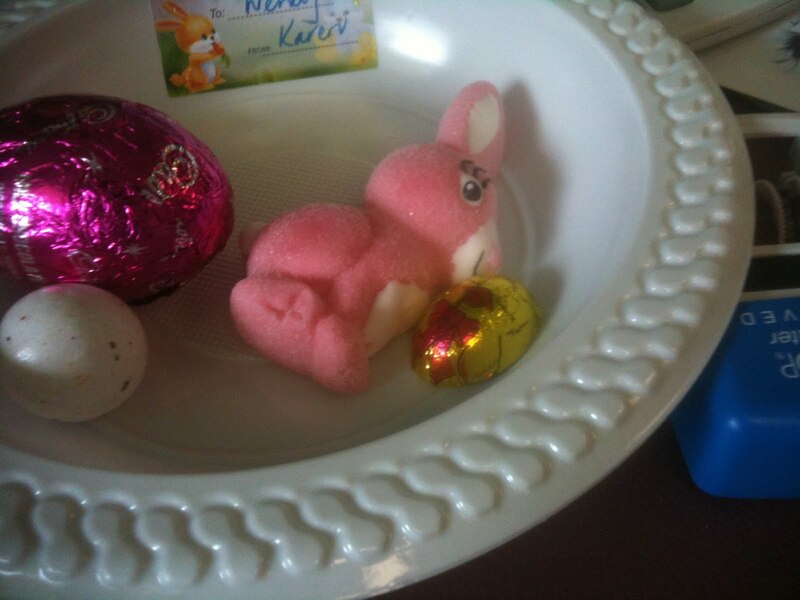 Warning, that small white egg on the left underneath the pink Cadbury egg is perhaps the worst tasting excuse for an Easter egg I have ever eaten. Ever. In my life. I had to eat the Cadbury egg straight after to get rid of the awful aftertaste. Sort of a mixture of bugs, deoderant and jelly. Just generally defying description.